The Knicks' 2011–12 regular season ended last night, and the playoffs begin tomorrow. That's really soon! So we thought we'd take a brief timeout from all the playoff ramp-up and take a look back at the season that just ended. The Knicks ended up with their best winning percentage since 2001, but that doesn't even begin to tell the story of this lunatic season. A coaching change, countless injuries, about 40 failed point guards, a Twitter controversy, a star player admitting he wasn't playing hard, the birth of Novakaine, a probable Defensive Player of the Year, the emergence of Jorts, a tragedy involving your star power forward, three winning streaks of five games or more, two losing streaks of six or more, and — oh yeah — perhaps the most fun sports fortnight of the last several years, an out-of-nowhere Asian-American point guard from Harvard who liked to do nerdy handshakes. It has been a lot to take in. Because, for all the frustrations, this has been a year of celebration, so we thought we'd take a look at the ten biggest Knicks wins of the season. After all: Who wants to remember the losses? We hope you enjoy this little trip down truncated, lockout-compressed memory lane. 10. Christmas Day: Knicks 106, Celtics 104. No one remembers this game any more because of all the different permutations of the team since then -- and the fact that they lost four of their next five games -- but it was a romping way to start the season, beating the hated Celtics in the first game of the almost-lost-to-a-lockout season. 9. March 17, Knicks 102, Pacers 88. Just four days after they fired coach Mike D'Antoni and appeared to be an organization in chaos, the Knicks won their third game in a row. It was the second game of a home-and-home with one of the best teams in the Eastern Conference, and it might have been the best game Jeremy Lin and Carmelo Anthony played together. 8. February 6: Knicks 99, Jazz 88. Six minutes into the game, Carmelo Anthony left with an injury. Amar'e Stoudemire missed the game because of the death of his brother. But it didn't matter, because it was Jeremy Lin's first start: He scored 28 points, dished out eight assists, and turned the ball over eight times, not like anyone cared. We were at the game, and we remember thinking, once Carmelo went out, Wow, the Knicks have zero weapons right now. But they did have one, and that was enough. 7. February 19: Knicks 104, Mavericks 97. National television on a Sunday afternoon. The defending champion in town. The height of Linsanity, the whole earth watching, Lin on the cover of Sports Illustrated. And the Knicks went out and played one of the giddiest fourth quarters you'll ever see (in J.R. Smith's first game! ), in front of God and Mark Zuckerberg and everybody. After this game, you couldn't help but think, You know, if they could figure this out ... this team could compete for a title. 6. March 14: Knicks 121, Trail Blazers 79. Not a difficult game, to say the least — the Trail Blazers traded away most of their team the next day — but vital in the Knicks season. Earlier that day, Mike D'Antoni had shocked everyone by resigning, and Knicks fans, primed to blame someone for the end of the Linsanity ride, actually booed Carmelo Anthony during introductions. Then Carmelo went out and hit his first six shots, the Knicks led by 26 at halftime, and interim coach Mike Woodson wouldn't lose for another week and a half. This season could have gone sour that night; MSG was certainly prepared for it. But then it turned around, and the Knicks never looked back. 5. February 4: Knicks 99, Nets 92. The Knicks had lost eleven of their last thirteen, and D'Antoni's job looked in serious jeopardy; turns out, his system just didn't work without a point guard. Out of desperation, he turned to the D-League kid with the flattop and the goofy game ... and the rest was history. You might have read something about what happened next. 4. April 17: Knicks 118, Celtics 110. Those blasted Celtics again, but this time, the Knicks just couldn't miss from the three-point line. J.R. Smith hit seven three-pointers, and Steve Novak hit eight. The Celtics have a higher seed in the playoffs, but this night, for the first time in memory, the Knicks legitimately looked like a better team. 3. February 10: Knicks 92, Lakers 88. Before the game, Kobe Bryant said he didn't know who Jeremy Lin was. After Lin scored 38 points — 38 points! — Bryant knew, and so did all the fans who suddenly were buying more Lin than Kobe jerseys. To remind you how weak this Knicks team was at this point, Bill Walker was starting, the second and third leading scorers were Iman Shumpert and Jared Jeffries, and J.R. Smith wasn't even on the team yet. And, somehow, Lin beat Kobe and the Lakers, pretty much all by himself. 2. April 8: Knicks 100, Bulls 99. The night that Carmelo has in his dreams, every night, the night that exemplifies everything Carmelo is about, for better or worse. Anthony drained massive, jaw-dropping three-pointers at the end of both regulation (to tie) and overtime (to win) against the best team in the NBA. It was Carmelo at his absolute peak, reminding everyone why, in fact, he was thought worthy of trading a whole team for in the first place. 1. February 14: Knicks 90, Raptors 87. We understand that this might be a controversial pick. It was a road game against a lousy team, the Knicks played poorly all game, and it might have been the worst Jeremy Lin played during Linsanity. But that might be a reason to argue for this game: This was the night when Linsanity went from the wildly improbable to the surreal. Lin took over in the fourth quarter, leading an incredible charge back, culminating in his shocking, out-of-nowhere, hit-the-roof three-pointer at the buzzer. God, we love when he looks at D'Antoni for the playcall and is met with, "Hey, kid, just go." 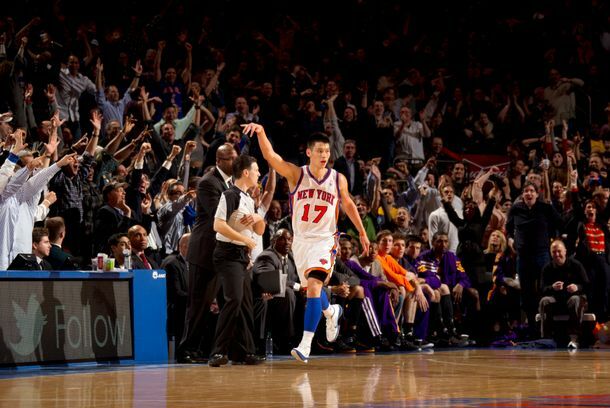 It was, to our minds, what Linsanity was all about: The impossible giving way to the rapturous. It wasn't the best game of the year, and it wasn't the most important game. But when we look back on this regular season, it's the play we'll remember the most. Of course: This season has more memories left to come.